Perfect Parker Fadley is cracking. She comes to school with tangled hair and muddy shoes, her teachers and friends all worry about her, but the truth is, she just doesn’t care. Or, she seems not to care. All she wants to do is disappear or be ignored and forgotten (and not even the thought of Miami gift baskets can make her snap out of it), but everyone else around her is carefully watching over her. And then there’s this new guy, who seems to want to know Parker despite her insistence in him away. What’s worse is she seems to be falling for him, too. Parker Fadley is starting to crack, and she’s not sure if she can keep it together longer before anyone else finds out exactly why she’s pushing them all away. My first Courtney Summers warned me enough to expect that her books aren’t the happy, shiny contemporary YA novels that bring warm fuzzies to the heart. Oh sure, there are some nice, romantic enough scenes to give the warm fuzzies, but the rest of the novel? They’re usually intense scenes that makes you wonder just how exactly these kids got into these situations. 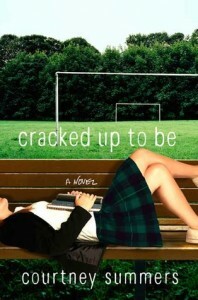 Cracked Up To Be had the same kind of popular mean girls that Courtney Summers seem to know so much about, and it’s an interesting journey to see just how their lives can be just as messed up as anyone else’s. I remember being a bit exhausted after I finished reading my first Summers, Some Girls Are, because of the intensity of the power struggle between the popular girls in the book. However, for Cracked Up To Be, I was just a bit sad at how Parker beat herself up so much for that secret that she kept that made her crack. I liked how everything wrapped up in the end, leaving me with a bit more hope for Parker than I had at the start. I’m glad to hear that you liked this book! I haven’t read any of Courtney Summers’ books, but I’m really excited to read This is Not a Test. Oh my. I forgot about the dog. I loved them together. Nice review! Fall for Anything is my last Summers novel to be read. Sad.